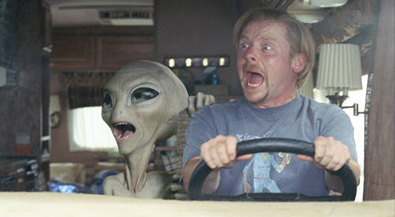 Clive (Nick Frost) and Graeme (Simon Pegg) are a couple of British science fiction nerds who, after making a holy pilgrimage to that mecca of fandom, San Diego Comic-Con, embark upon a transcontinental road trip to visit sites associated with extraterrestrial activity. After antagonizing a pair of redneck types (David Koechner and Jesse "Landry" Plemons) in a bar, they drive off in a hurry, inadvertently witnessing a night-time car crash. As they survey the wreckage, cigarette smoke and a gruff voice float across the desert air. Out of the shadows steps a little green man named Paul (voiced by Seth Rogen). Paul is an alien who has been held by the government for more than 60 years, and he has escaped in order to finally go home. Faced with the opportunity to befriend a bona fide alien, Clive and Graeme decide to help him, unaware that Paul will prove to be the least of their problems. The first film to not only star Pegg and Frost but also be co-written by them (their previous films together, Shaun of the Dead and Hot Fuzz, were written by Pegg and director Edgar Wright), Paul's humor manages to be both more accessible than their previous work whilst also being more focused on gags aimed squarely at the geek demographic. The tone and style of the film are far broader than their work with Wright, largely thanks to Greg Mottola's (Superbad, Adventureland) more conventional, less exuberant eye and a cast full of some of the biggest names in American comedy, particularly Kristen Wiig as a creationist whose faith is shaken when confronted by Paul, whose existence contradicts everything she believes in, and Jason Bateman as an FBI agent on their trail.